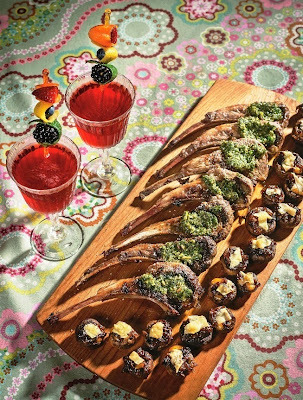 Our ’69 Cocktail paired with Lamb Chops with Mint Gremolata and Cheddar and Caramelized Onion–Stuffed Mushrooms. Photo by Noah Fecks and Paul Wagtouicz, from The Way We Ate. Both of us were alive in 1969, albeit as toddlers. There was so much happening in the news that year—the moon landing, Woodstock, the Stonewall Riots—a lot for a young mind to even begin to comprehend. But these events greatly affected those around us and the vibes they gave off shaped the way we perceived the world, the way we matured, and even the way we ate. As we grew up gay, we poured over books that would lend credence to our existence and provide a historical context for how we came to be. We learned about the Stonewall Riots, the angry drag queens who had enough from the police and decided to stand up for themselves and be heard. The closet door flung wide open. So when photographers Noah Fecks and Paul Wagtouicz, inspired by Gourmet magazine’s prolific output during the last century, asked us to come up with a chapter for their book The Way We Ate, we immediately thought 1969. In coming up with a cocktail and hors d’oeuvre pairing to commemorate the Stonewall uprising on June 28, 1969, we decided to look to history not only for inspiration, but for the ingredients we would use. Since the Riots erupted in Greenwich Village, Manhattan, we base the ’69 Cocktail on the seminal Manhattan Cocktail, but also the International Bartenders’ Association 1969 winning drink, which used Canadian whisky as its main spirit. Since we’re rye’s best friend, we use it in the ’69 instead of Canadian whisky. (Canadian whisky was commonly referred to as rye, and you can still hear some old-time bartenders call it such.) We then mellow it with some brandy, make it food-friendly with the addition of sweet vermouth, add a little grenadine for sweetness, and for that magic touch, Galliano, a liqueur that inexplicably transformed into a vanilla-spice syrup in the late 80s, but has returned to its original complex recipe, the one that would have been used in 1969. Once the contents of the shaker are poured into a chilled coupe, we express a little orange oil over the ’69, thus adding an aromatic layer that brings all the elements of the drink together and allows for easier pairing with food. The ’69 Cocktail will appeal to those who like their drinks a little sweet, and those who like their drinks on the drier side. It’s a happy medium. The ’69 Cocktail is not so much a celebration of the 1969 Stonewall Riots, but a meditation. One that you can sip while reflecting upon history and how we have come to be who we are today. But as gay men, we can’t just leave it at that. We had to add a garnish that would make this drink more playful. Riffing on the iconic rainbow flag, we chose a fruit to represent each color—blueberry, raspberry, blackberry, orange peel, lime peel, and lemon peel—and fashioned it into a fabulous panoply of smell, hue, and texture. Drop it in your drink and sip with pride. The berries will soak up the booze, which makes for a happy ending to your cocktail. Preparing a round of ’69 Cocktails. Let your rainbow imagination run wild. As far as pairing the ’69 Cocktail, we have come up with a few hors d’oeuvres that are easy to make and can be eaten before or as dinner. We’ll publish those recipes at a later date, but do buy the book. There are 100+ recipes to make so you might as well start now with the ’69 Cocktail. Makes 1 drink, but feel free to split it with a lover, friend, or trick. blueberry, raspberry, blackberry, orange peel, lime peel, and lemon peel, or other very colorful garnish, such as Gummi bears (skewer them on a garnish pick in a rainbow pattern, as if they were part of an ursine chorus line). Shake first five ingredients in ice for 20 seconds. Strain into chilled cocktail glass or coupe. Pinch orange peel (peel side out) over drink, allowing the oils to express into it, rub around rim, and discard. 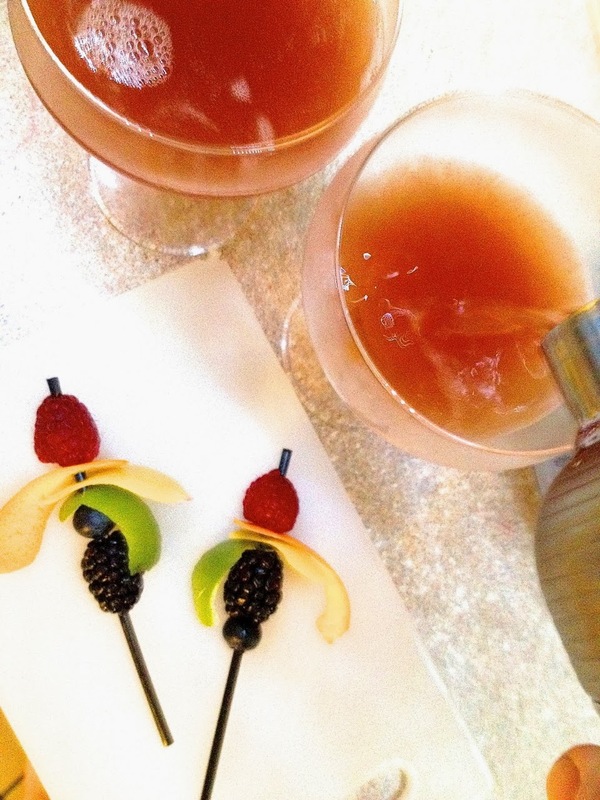 Garnish with berries and citrus peel, in an artistic fashion, skewered through a pick. Note: For a fruitier cocktail, you can add a berry or two of your choice, before shaking. If you do, make sure to double-strain so as not to get any seeds in the drink. If you don’t want to buy premade grenadine, homemade grenadine is easy to make. For a smaller batch, halve the amounts. Bring pomegranate juice to a boil over medium–high heat. Reduce heat to a simmer and add sugar. Stir gently until sugar is dissolved. Keep heat low and simmer for up to 15 minutes, until mixture is slightly reduced. Allow to cool. Add vodka and stir. May be kept for several months in the refrigerator in a clean 750ml bottle (or 325ml bottle for half recipes). * You can also make your own pomegranate juice. Cut up two large and heavy pomegranates (if you’re very adventurous, you can try to peel off the outer red rind), place pieces one at a time in a citrus squeezer, and squeeze the juice out of the arils into a deep bowl. (This is very messy, so make sure to wear an apron and have a damp cloth ready to wipe up any stray squirts.) Add a splash of water. We’ll publish the recipes for the pairings soon. But for now, enjoy the ’69. so so good. I could live on those mushrooms!! And the cocktail took me over the rainbow! Thanks, batski! We love your moniker. Very Banksy. we can not wait to try. Our stomachs are erupting with hunger just thinking about it. mussrums and limbchops awsum. Oops too many 69 cocktails..
LOL! Guess what we're having on Christmas Eve.